Ready, set, vroom! 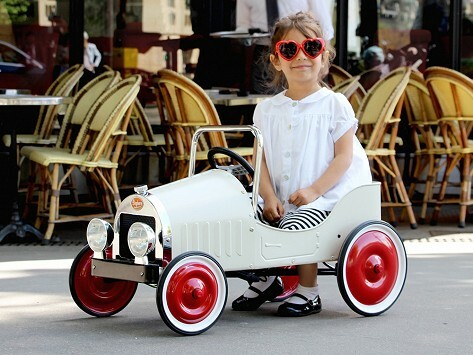 This vintage-inspired pedal car for kids is not only fun for little drivers, it’s also beautiful for grown-ups to look at. This sleek and sophisticated-looking car is designed in France. It is powered by kids (they can even pedal in reverse) and has a durable metal body, rubber wheels, and functional steering wheel. The pedals and seat can be adjusted as kids grow, too. But it’s the authentic 1930’s details—chrome lights, vintage seats, and a retro license plate—that makes this mini classic car really shine. Bought this for our grandson... ton of fun.